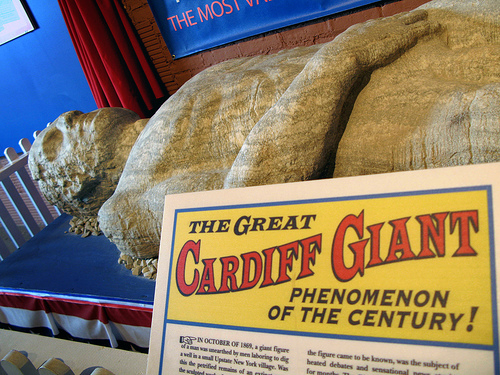 The Cardiff Giant was actually a hoax that was created in Cardiff, New York, in 1869. 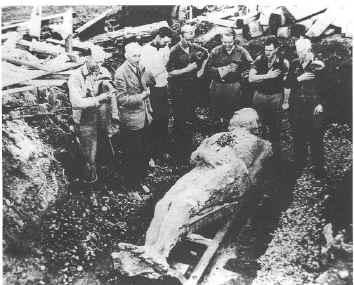 The giant in question was a 10 foot tall stone man, found deep in the ground when some workers were digging a well. Word got out about this incredible find and people from all around started flocking to get a glimpse of this prehistoric wonder. This amazing discovery of course was not a real petrified giant, but a hoax concocted by George Hull. A year before he had had an argument with a clergyman about the bible, and if one should take everything written in it as fact. The clergymen insisted that as the bible states that giants once walked on Earth then they really must have. Hull continued his argument but could not convince the religous man that giants had never existed. But it did give him the idea that people really will believe anything. 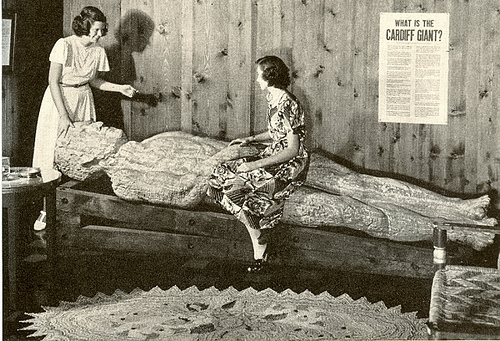 Hull arranged for a large block of stone to be carved to resemble a giant, naked corpse, and to simulate pores in the giant’s skin, Hull made special hammers by setting needles in lead bases. To make him look antique, the stonecutters rubbed him with sand, water, ink, and sulfuric acid. By unexpected luck, veinlike lines appeared in the stone. 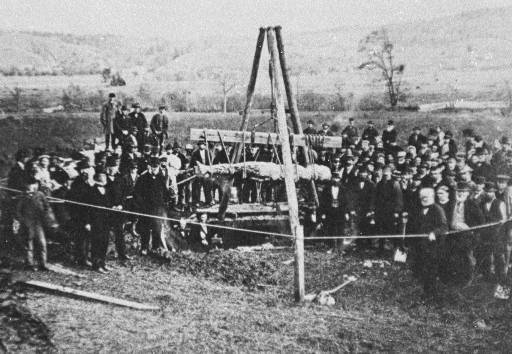 Hull made a deal with his relative, William Newell to bury the stone man on his farm. They waited for a year, then Newell hired some men to dig a well for him, he pointed to the exact spot he wanted it and the men began to dig. As they dug deeper, the plan came into action when their spades struck something hard. It must have been hard for Newell to keep a straight face throughout the initial discovery, as the giant was pulled out from its earthly tomb and word began to spread about this find. Scientists who came to inspect it did not think it was a real petrified giant, but did think it was some kind of ancient statue. This was good enough for Hull and Newell, and they began fencing off the area and started charging the public to see this stone wonder. Eventually there were closer inspections of the statue, as Hull refused to sell it for huge amounts of money. There was even a copy made of it to prove that it could easily be done! Scholars inspected it more rigorously and noticed the fresh tool marks and crevices where the sulfuric acid had not reached. The game was up. 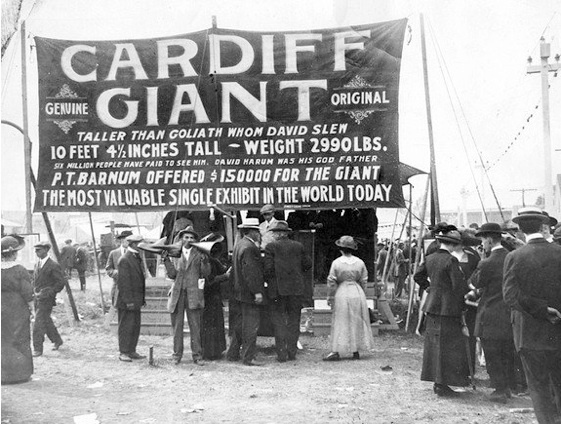 Hull sold his giant to the carnival and lived a wealthy life for a time, having made a lot of money from his enterprise. But bad investments on his behalf ensured that he didn’t stay rich for long. He ended up broke and even tried his stone giant hoax again in Colorado! He ended his days in England, broke and destitute, but safe in the knowledge that he had played one of the biggest pranks in the world.